This morning we had our second snowfall! 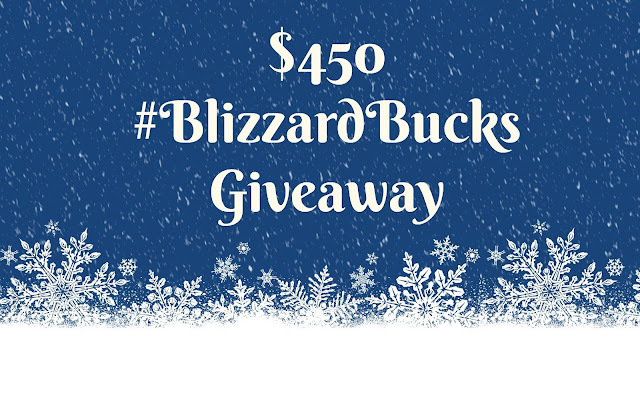 In anticipation of that snowy weather and in the spirit of gift giving, I've teamed up with some other bloggers to give you a $450 giveaway! I haven't even had a chance to put up a non-giveaway post since my Holiday Gift Guide Giveaways went up and here I am with another giveaway.. but who couldn't use $450 to spend on gift for others, right?! The giveaway is open worldwide and you can win $450 CAD, paid via PayPal! Oh, I would do some Christmas shopping on Amazon. I would go on an adventure :) Much needed study brake among this crazy partial strike as a University & College student! Would definitely use it for gifts, might even get a gift for myself. I would love to get a Kitchen Aid Stand Mixer! I would spend it on a night away at Christmas time. I would love to win and I'd put it towards holiday gifts for my kids. My son wants a new ipod! I would buy a new camera for my family and board games for the extended family! Wow, this would be so lovely to win right about now! Thank you! I would use it to buy some gifts and for buying Christmas dinner groceries. I would buy a plane ticket to see my fam! I would use it towards Christmas shopping! What a fun prize. This would go a long way toward some electronics I’ve been looking at. I would buy nice Christmas presents! This would come in handy anytime of year, but especially around the holidays. Thanks so much! I would take my family for dinner and movies ! I would use it for holiday shopping including meals, gifts for my family. I would buy my husband Enchroma glasses. I would use the money for gifts for my daughters. Toys for 4 year old boys aren't cheap! I would be able to get my nephew the crazy Transformers he wants without going broke, lol! I would use it to upgrade my phone! I would use it to get my daughter in Ballet! She's almost 6 and has been asking for a while. $450 would be an amazing gift! I would use it to buy my parents a snowblower. towards furniture we need for the house! I'd put it into some car maintenance. I would spend the #BlizzardBucks on new winter boots for the family! It will be going towards helping a family who could use it. A little help with a dinner and some extras will go a long way for them. Merry Christmas! I would buy lots of toys for my kids! Some nice gifts for the hubby and kids is how I'd spend the Blizzard Bucks. I'm already doing this giveaway on a different blog, very little hope of winning though since 1) it's money and two it's WW. It would let me get some nice gifts for family and friends. Definitely would go towards Christmas gifts. If I won, it would go towards our heating bill! our bill is crazy in winter!!! I used it to buy Christmas presents for my family. I would use half to buy presents for my family and half to donate to a children's shelter for the holiday! I would buy Christmas presents for my kids and family. I would also put some aside for a family trip! This would be so great to help with Christmas and put towards a family vacation! Oh wow, this would be amazing to help with gifts and just holiday expenses in general for the family. I would use it for Christmas shopping with most of it going towards three senior dog hospices that I support. I will buy some extra gifts for my kids!